- Albert ... A 15 pound, wire-haired bundle of nerves. Afterwards I walked down the beach to have a look at the boat ramp. Located where the river enters the cove, it hardly deserves to be called a ramp. It looks more like a ford, and you might be tempted to drive across. The residents all use it to launch their fishing boats, and commercial fishermen from San Bruno bring their pangas—twenty-foot, flat-bottomed, fiberglass open boats with high bows and outboards. I met the local knowledge there, by the name of Joe. He has come to San Lucas Cove to fish for 24 years, and was kind enough to give me a run-down. From the ramp you leave the river mouth for a gate consisting of four posts set on shallow submerged rocks. Entering it with a sharp turn, you pass through a narrow channel, dredged by backhoe, to the left of centerline. When well clear, turn south again for the mouth of the cove. Heading for a small white building on the south shore keeps you in the eastern third of the water. As you approach the spit, keep 50 feet off while passing a stand of mangrove, to thread a small gap in the sand bar. Keep an eye out for a floating blue bottle that marks a shipwreck. Then turn for the entrance, giving due caution for another sand bar extending from the headland. After that you are at sea. In the morning we rigged up the boat and loaded gear. It was mid-morning with the tide ebbing, but not quite at low water. The entire tide in the cove is around two feet. A number of people mentioned the low water, but it was not stopping pangas and sporting boats from entering and leaving, some at remarkably high speeds. Launching felt like floating the boat in a mud puddle. The outboard started on the first pull, we backed into the stream and headed out on shallow water drive, with the sun in our eyes. The depth finder read around two and a half feet, just forward of the keel. The gate is only around 50 feet out, but my orientation broke down. Very quickly we were skimming the bottom at well under two feet. Then the keel grounded on sand and stuck. With water barely above my knees, we went overboard and began wrestling the boat. By twisting, rocking, and cursing we eventually worked it free. The first mate wanted to walk, but came aboard in time to pilot from the bow. In the clear water I could see the bottom sand and rocks, and the tiny channel through the gate. My nerve broke; there didn’t seem to be enough water to get a rubber duck through. We slouched back to the landing and hauled out. The next morning, high water was at five AM, sunrise at 6:45, and our launch at 8:30. We heard the same warnings about low water, but I try not to learn too much from my mistakes. The water level looked just a touch higher, and the finder read three or four inches more. We headed out dead slow and made our first turn smartly. As I aimed for the left side of the gate, Jennifer began signaling me to starboard. I was taken aback. This was not in the directions. But she was the man on the spot, and if I went against her pilotage I would be running on guesswork. We turned gently starboard. Midway through the gate, with the depth finder at 1.7, the keel brushed the bottom, just for a second. Then we were through. To my immense relief the gauge rose to 1.9, and then over two feet. We kept on course, delaying the turn south till we were at least 100 feet out. Paralleling the shoreline, depths ranged up to five, even six feet, then began slowly shoaling. We oooked around for a safe course. Around this time, a panga on the way out overtook and passed us, some distance to starboard. We adjusted hastily and, after some tense moments, saw the bottom drift downward. At the same time, the marker of the shipwreck came in sight. The wreck itself could be seen only as a vague shape under the surface. Passage through the sand bar was indistinct, only a few inches deeper than the bar itself. After that it was only a stretch for the exit. The bottom fell off to six feet, then eight. When it reached double digits I celebrated by lowering the rudder and centerboard. Five nautical miles offshore, and five nm in length, Isla San Marcos is in no way hard to find. The south end has a gypsum mine, a village, and a large pier. 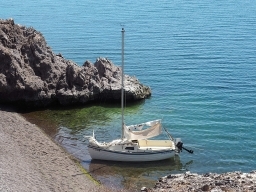 To the north are several anchorages around the rocky outcrop of Punta Piedra Blanca. With the sails raised we lost no time in heaving to for some swimming and relaxing. (Somewhat later we learned that there are hammerhead shark in the waters.) After that, we got back to sailing. There was still little wind, but what there was, was fair for the island. With the sails trimmed as well as I can manage, we made slow but steady progress. A mile ahead, a sailboat crossed our track, heading north on diesel, with bare poles. Much closer was something unidentifiable floating in the water. As we came closer it became no less puzzling. What I saw was the size and shape of a seagull’s wing, sticking up out of the water, but black. It came abeam at 100 feet and I changed tack to come closer. I had just begun to suspect, and called Jennifer, when the sea lion raised its head and, with an annoyed look, rolled the rest of the way over and disappeared. Not long after, rippling water marked a freshening breeze from the southeast. We picked up speed—not much, but still steady. It appeared we would make the island on a single tack. Half a mile out, the wind shifted northwest. The gypsum mine, marked by a plume of dust, was in full swing. The northern anchorages were clear. On the north side of the point is a small inlet that the guidebook recommended for snorkeling. On the south is Sweet Pea Cove, with two small beaches and a fishing camp. A cruising boat of around 30 feet was anchored off the south point of the cove. A couple in an inflatable dinghy met us from the cruiser. We exchanged a few words with the pair, who were on their way around the point to snorkel, then on to Santa Rosalia. When they went on, we continued for the larger of the beaches, and the fish camp. I payed out the anchor 60 feet out, in 12 feet of water, and we crept in. The first try found us bracketed by large submerged rocks. The second, at the south end of the beach, found nothing but sand. The bow nosed gently up to the beach, and a minute later we were anchored. The early afternoon passed pleasantly. Around 2:30 we were ready to head back to catch the rising tide. This time, the wind was not in our favor. The outboard, somewhat oversized for the 17, turned out easy speed without breaking out of its idle mutter. A 250° course took us straight back to the cove. Sailing in was easier than out. The landmarks were closer to the entrance and easier to see, and the sun was behind us. A panga crossed the bar at speed. He also had a lookout on the bow, but the lookout was riding in the Superman position, looking almost, but not completely, unlike a carved figurehead. We hardly raised a hair at the gate. The hardest part of the afternoon was shoving the boat onto the trailer in shin-deep water with a crosswind. Then we returned to camp for a fire, supper, and a good night’s rest, before moving on in the morning.